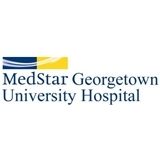 MedStar Georgetown University Hospital Urology (Washington) - Book Appointment Online! Very impressed! No wait time, professional, answered all of my questions, explained everything in terms I understood. Rapid follow-up. Very positive experience. Highly recommended.